It is time for our second annual nonfiction november. This month, six different writers will be writing essays to words bibliomanced for them. Each of them has one week from the time they receive the word to write their essay. The word they receive at random is a constraint. The time they have to write is a constraint. The question may arise: is it enough? will I be able to? is it enough? Over the years, I have fallen in love with constraints. To me, constraints mean spaciousness. The blank page or blank screen looms ominous when you have no idea where to begin. When a beginning is offered, no matter what beginning it is, that is one less thing to think about. You have a place to start. You have been given one. And so you start there. 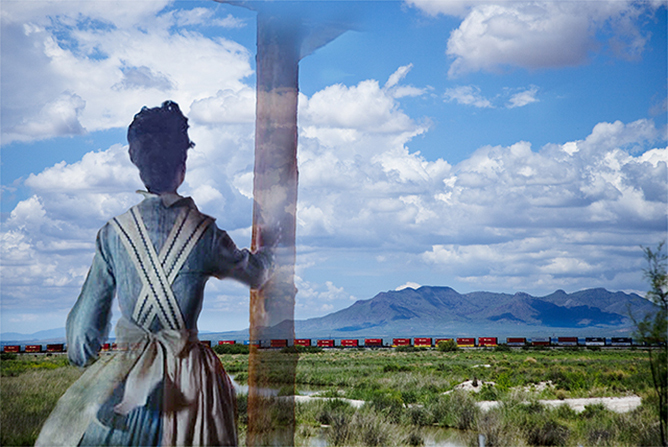 Yesterday, I took my students to an exhibit at the University of Arizona Museum of Art by photographer Patricia Carr Morgan entitled: “Reality is a good likeness.” A likeness: “the fact or quality of being alike; resemblance.” In her artist statement at the beginning of the exhibit Carr Morgan starts with an oath: “I swear to the truth, the whole truth, and nothing but the truth.” Then, in recounting personal memories and explaining their impact on her work—seeing a familiar piece of floral fabric hanging in a tree on returning home from junior high and thinking, that’s odd, before seeing the “charred skeleton” of her burned down home behind—she slowly begins to thwart that oath by revealing what she means by truth. The lines between reality and likeness are blurred, in her words and in her images, which rely heavily on juxtaposition to explore American cultural myths. She delves into film noir, the wild west, county fairs. She places a movie camera at the forefront of an image of a woman looking through a camera in the film “Peeping Tom” so that the watcher becomes the watched. She superimposes the large black and white image of the sheriff from “High Noon” who fills the walls of an empty courtroom. She makes a diptych of two images rich with violets and light pinks and white. The two images? One: a bucket of zinnias. The other: a woman in a purple shirt removing the innards of a butchered cow. Reality is a good likeness. I asked my students questions: what has the most dominance in this photograph? to what in the image is the photographer directing our eyes? is there contrast? what is the angle? what do we think is happening beyond the frame? Constraints can give us freedom by providing boundaries to work inside. Nonfiction can run right up to the edge of fantasy. There is so much possibility in what we can create. Perhaps we are not frightened by our limits but by the limitless of it all. Expansion and opening. Constriction and shutting. Are these enemies or cohorts in the artistic process? The beginning is what we have. What’s real is what we have. Let’s start here. It is enough.